On days 11 and 12 I published two halves of a story. This story was written for the purpose of showing you what I do when I edit. I have deliberately published a first draft, with very little editing apart from immediately spotting spelling mistakes etc so that you can see how it will change from first draft to the finished story. When we are children, we write a story and it is done, but as adults, there is always polishing that can be done. Sarah (Arrow) has said that your blog posts don’t have to be perfect – no, they don’t, it is good if they are as close as you can make it in the time that you have. Today, I’m going to focus on characters. In this story, there are two main characters: Janice Jones and Joseph. I don’t usually make all my characters in a story begin with the same name, but today, I have! The characters are rather sketchily drawn – only small details about their appearance are mentioned in the story. Feet hurt – does this indicate high heels? Needs a cup of coffee – addicted to caffeine? I am amazed that this is the only description of the appearance of Joseph, so I think I would add a few more details, but would try to make sure that they add to the story rather than just inform the reader. So, there is more about Joseph’s personality than his appearance. This perhaps makes him a little mysterious which was probably my intention in the first place. The final character in the story is Peggy. 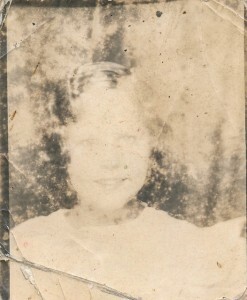 Her story is told in flashback and through a photograph that Joseph finds. She is a young girl who knew Joseph as a young boy. We know that she died young and that her death affected Joseph. The story ends with Joseph saying goodbye. Was he saying goodbye to the house, Peggy or both? The story leaves it to the reader to decide.